None of this, of course, discouraged pro-coal President Trump from his own recent political visit to West Virginia as the quack medicine man Dr. Dulcamara, who sells “love potions” to the peasants in the opera “Elixir of Love” to increase their amorous appeal. 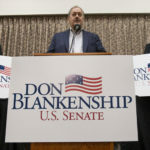 In his latest round of far-fetchedness Trump appeared comfortably seated at a public forum between Blankenship’s two GOP rivals in the state, which easily went to Trump in 2016. And at this moment Trump, who has talked of “beautiful clean coal,” is offering cynicism and deception to rule the day in his comfort zone, with his soaring imagery as the savior of the dying industry. Meanwhile, studies have shown the destructive effects of coal dust. A report in the Journal of the American Medical Association in February told us of the highest “level of black lung disease in coal miners ever reported”. Beautiful, fantastic and all of the other potions from the White House in a betrayed state that has never been redder. However, megamillionaire convict Don Blankenship is back on the ballot.